The fantastic Tahitian Group of the Starlight! Enjoy the best in Hawaiian and cosmopolitan luau delicacies, flavored with only the finest cultural entertainment in the islands! Be greeted by live music and a traditional Hawaiian lei greeting as you gather for the customary Conch Shell Blowing Challenge. Enjoy a lavish all-you-can eat dinner buffet including a variety of popular, local dishes. Then sit back and relax as you lose yourself in the wonder and excitement of the Voyage Across the South Seas Show. Watch traditional dances from Hawaii, Polynesia and the Pacific. Enjoy the skilled performance of our 4 acrobatic Fire Knife Dancers. Located right in the heart of Waikiki, this luau is perfect for those who don't want to drive to enjoy a luau. Golden Circle Premier Seating - Most Popular! You can book a maximum of 230. A magical show at the Waikiki Starlight Luau! 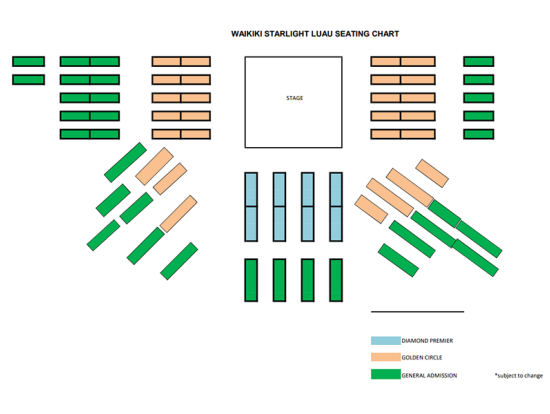 Secure your seats close to the stage with Golden Circle seating. Includes a lei greeting, mai tai punch & 1 beverage. Welcome activities include a cocktail reception, photo opportunities, traditional games, and chances to visit stations with Hawaiian tattooing equipment and other crafts. Enjoy a delicious resort-quality tropical dinner buffet. Enjoy live music and dance performances from all across the Pacific, including hula, chant, and fire knife dancing! 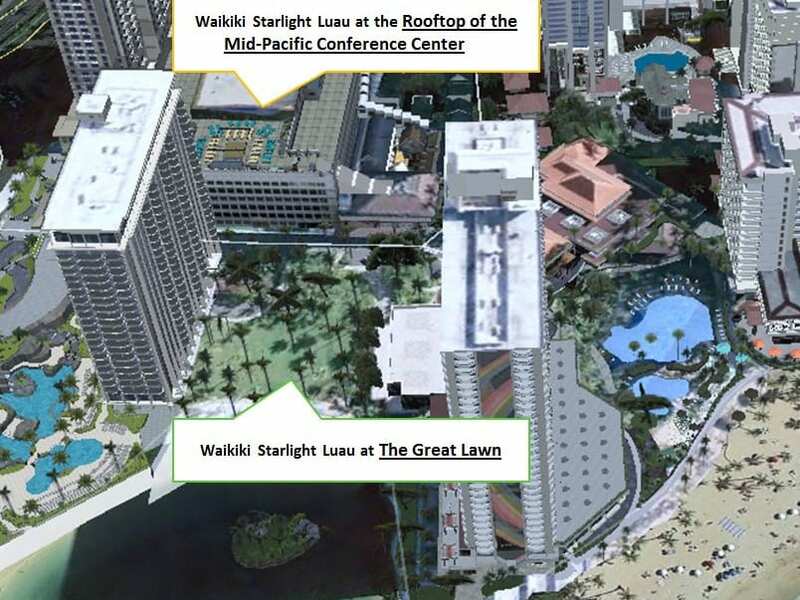 Hilton Hawaiian Village’s Waikiki Starlight Luau is located on the rooftop of the Mid-Pacific Conference Center (schedule subject to change). Please Note: From November 22 - 29, 2018, and December 24 - 30, 2018, the Waikiki Starlight Luau will be held at the Great Lawn of the Hilton Hawaiian Village, which offers breathtaking views of the Duke Kahanamoku Lagoon. Complimentary valet & self parking is available at the Hilton Hawaiian Village. Please validate your parking ticket upon check-in. You can book a maximum of 255. This package includes general seating at the luau and a Maitai Punch. You can book a maximum of 64. Of the two styles of hula, auwana is more modern. Sit front & center with Diamond seating (1st & 2nd rows). Includes a lei greeting, mai tai punch, 2 beverages & priority access to the dinner buffet. Complimentary parking is available at Hilton Hawaiian Village. Please have your parking ticket validated at the luau check-in desk. A "no show" fee may be charged in the event the guest no-shows and the reservations have not been cancelled prior to 48 hours in advance of the booking event date. Reservations cancelled within 48 hours of the event will be considered as a "no-show", and the full purchase price will be forfeited. Reservations cancelled prior to the 48 hour period will be refunded in full. Yes, at least 24 hours advanced notice is required. Please indicate during booking so that we may secure your arrangements. Yes, very much so. However, premier seating may be intimidating for very small children during the fire dance as you will be close to the stage & performers. If it is raining before the luau begins, the luau will be moved indoors if there is a banquet room available. In this case, there will be no fire dance. If a room is not available, the luau will be canceled and you will be given a refund. If it rains after the luau has begun, management may decide to keep it outdoors, in which case ponchos will be given out to each guest. In this case, you will not be given a refund. The Waikiki Starlight Luau is held at the open-air Rooftop Gardens at the Mid-Pacific Conference Center.